Australia’s best Barramundi Farm is located in one of Australia’s best locations, the Daintree in Tropical North Queensland. Perfectly positioned on the Daintree River, Daintree Saltwater Barramundi Fish Farms is surrounded by World Heritage listed rainforest, the Coral Sea and pristine Great Barrier Reef. This unique location focuses the team in their commitment to operate in accordance with environmental best practice. Innovative and sustainable business operations have been implemented across the farm, resulting in a consistent supply of award winning Barramundi product. Daintree Saltwater Barramundi Fish Farms distributes its premium product around the region, state and country, delivering a reliable supply of fresh, quality Barramundi all year round. 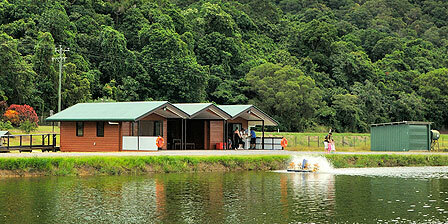 The farm is based on a 49 hectare property, with 3.3 hectares of licensed production ponds. The 14 earthen ponds are filled with the best salt water, sourced from the Daintree River, and are intensively stocked to ensure a consistent supply of first class Barramundi. Fingerlings are carefully selected from local hatcheries, to ensure only the highest quality stocks are on-grown. Starting at around 100 millimetres, the fish are grown to commercial size over 12 to 18 months, using industry best practice and husbandry techniques, in accordance with strict environmental management guidelines. This ensures we provide optimum growing conditions for our fish, whilst maintaining the delicate balance of our farm’s natural surroundings. 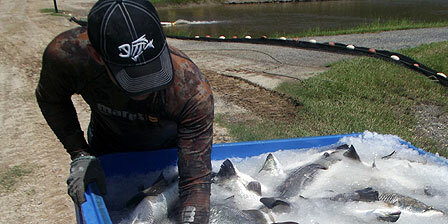 Daintree Saltwater Barramundi Fish Farms has been producing Australia’s best, hand-reared Barramundi for over a decade. In recognition of this, our plate-sized fish (400 to 800 grams) and whole fish (two to four kilograms) have consistently won awards at the prestigious Sydney Royal Fine Food Show since 2006. Check out our awards page for a full list of achievements. Whether you are buying for wholesale purposes, restaurant or home, we invite you to take the taste test; you won’t be disappointed! Premium, chilled, fresh (whole) barramundi is available from 400g up to 4 kilograms and can be easily transported around the region, state and country.